My final game in the set and returning to Talavera for the approach to battle, with the French arriving on map. Played as always solo, with the ‘In Command One Hex’ House Rule from Napoleon Against Russia and the ‘artillery moves like trains’ rule. I made a few changes to the setup. First as the French knew where the fords were I removed Card 16. 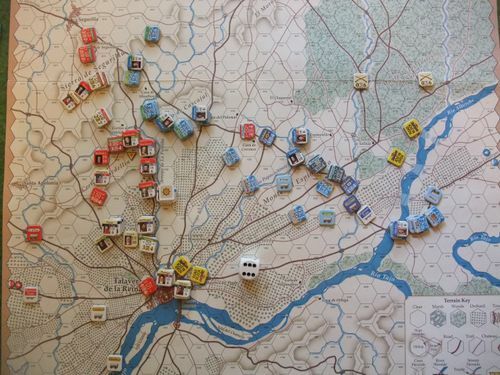 Second as there are no French forces on map at start – and so any mode card will have no effect – I drew one to get the movement allowance for the first day. And finally I removed the redoubt at Cortijo de Valdelfuente as I have not found any historical reference to its existence. Mid morning on 27 October finds most of the Spanish divisions north of the town, Alburquerque’s cavalry and Bassecourt’s Division are north of the Cerro de Medellin. Hill’s British occupy the hill itself with Campbell’s Division in the Pajar de Vergara redoubt. Wellington himself is with the British rearguard of the 1 and 3 Divisions. Both Wellington and Cuesta are ‘sleeping’. The French are about to enter and (hopefully) catch the British napping. Unfortunately for the French Wellington is immediately alerted to their presence. Sherbroook’s men burn the bridge [note – a recent amendment righty forbids this as this was a large stone bridge] and marched for the Cerro de Medellin while Wellington manged the rearguard. Victor’s I Corps repaired the bridge, crossed the fords, cleared the roadblocks, marched across the Allied army’s front and assembled on the Cerro de Cascajal opposite the British, with Latour’s cavalry to the north. Sebastiani’s IV Corps was delayed by a misunderstanding of its orders and a guerrilla raid in the rear caused alarm and despondence to I Corps. But by evening the French were gathering, joined by Mortier’s V Corps. Just as dusk arrived the British cavalry at the north of the Allied line launched a sudden attack on the French and routed two of Latour’s Brigades. But this was the only combat of the day. Overnight the British Light Brigade and Ross’s artillery arrived. The Allies had spread their line further north. Relying on the defence of Talavera and the Pajar de Vergara redoubt (which they had occupied) the Spanish had thinned their line to allow the British to mass on the Cerro de Medellin and Alburquerque, Bassecourt and Payne’s cavalry to extend the line north. Somewhat to Victor’s surprise the day opened with a combined British and Spanish offensive against his right flank. Latour had just rallied Perreymond’s and Oldenbourg’s brigades when the British struck again and completely shattered them, Latour himself was saved from death by his aide-de-camp. Luckily for him and Victor the Spanish cavalry attack failed and an attack by the 1 British Division was also repulsed. Joseph ordered the IV Corps and the Guard cavalry to the right flank and they pushed the Allies back. By 10am the French appeared to be in position – Sebastian IV Corps to the south of Victor’s I Corps with the Guard Reserve, Mortier’s V Corps facing the left of the Spanish army and Milhaud’s cavalry covering the rest of the front. However both Mortier and Victor told Joseph they were not ready [failed their command rolls] to attack before noon. Just before noon a fire broke out in the Plaza de la Alamecla in Talavera and as if this was a signal the French attacked along the line. In the north the British and Spanish cavalry were pushed back and the British pushed out of Valdelfuente; the Spanish counter-attacked and routed Laplanne’s Brigade, Solignac was only saved by his colleagues bolstering his flanks. 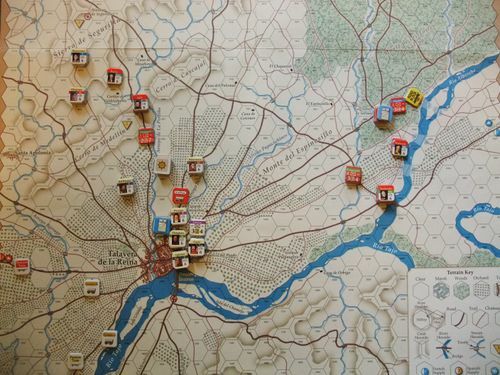 The French pulled back, I Corps attacks on the British on the hill being repulsed. Sebastiani’s Corps failed to push the British back from the stream, but south the Spanish 5 Division was routed from the Pajar de Vergara by V Corps. The Spanish Vanguard counterattack was repulsed, but as Mortier faltered De Parque’s 1 Division retook this key spot. While I and IV Corp still failed to shift the British from the stream Joseph led his Guard to attack the gap in the line south of the redoubt, crossing the stream as V Corps again retook the redoubt, routing the Spanish Division. The Spanish counter-attacks failed and the French began to push over the stream and drive into the south of the British line. 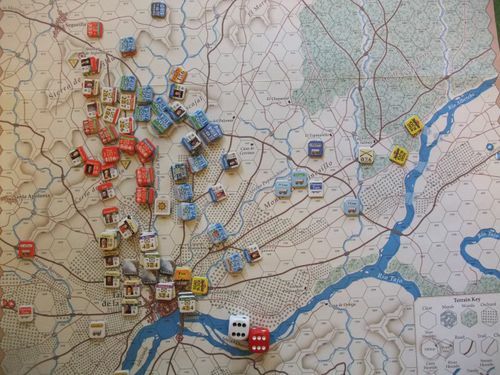 British attacks were repulsed, Hill was wounded and Pepin’s Brigade of V Corps pushed into the British rear. Seeing this Victor and Sebastiani attacked again, routing the British 3 Division and overwhelming the 2 Division. To the south Joseph’s advance had been halted as he lost the Guard Chasseurs and Corbalan’s Brigade. The Spanish line was holed as the Talavera garrison held on, but the other Divisions formed a raged line. Milhaud tried an attack on the Talavera suburbs – he was killed and his men fell back. At 5pm Wellington decided on retreat; his men disengaged and pulled back to Santa Apolonia and then marching off, leaving Bassecourt’s Spanish to be overrun by the French cavalry. To the south the Spanish centre was pushed back and Zayas commanding the vanguard wounded. Joseph decided to lead an attack by the various artillery unit stranded east of the stream plus some V Corps units in an attack on Talavera itself. At the front of his troops his horse was shot and he was captured as his men were repulsed. With this shock the French army paused, many units were disordered and mixed up, and the foe still presented a resolute front. The French commanders argued over who should lead the army. Foy took command of the reserve and as darkness fell stormed the town, routing the Spanish and leaving Portago, 3 Division commander, dead on the field of glory. Also dead was Joseph – stripped naked and shot by the Spanish as the town was stormed. Losses were heavy on all sides, the Spanish lost 20 SP, the British 19 SP and the French 25. The VP calculation was interesting. 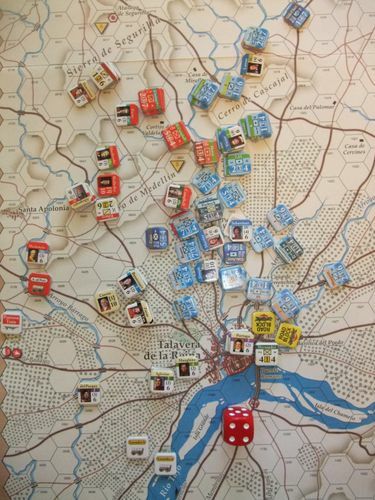 On the first day as the Allied occupation of all the victory hexes more than cancelled out any VP lost to card play. So despite the apparent thrashing on the battlefield we have an Allied Strategic Victory. The French had not actually occupied the Talavera VP hex – although as darkness fell they would have. Giving them 10 VP for that we have 9:14 – a marginal Allied Victory. And ignoring the cards we end up with 25:34 – still a marginal Allied Victory. Anyway you count it this was a French defeat – not to mention the end of Joseph, el rey intrusive. Nice to see the errata helped get the French over the river Andrew... as they should. Have to admit, that points countback came as a surprise. Irony: I just played this battle tonight without the errata, and the French got totally hosed trying to cross the river. Mackenzie and Sherbrooke were going to win the entire battle by themselves. After checking the rules again for the umpteenth time, I said: "I should check BGG to see if anyone else had this problem." Well, luckily I called it by 3:00 pm. It won't take too long to start over. Thanks for the AAR as well!